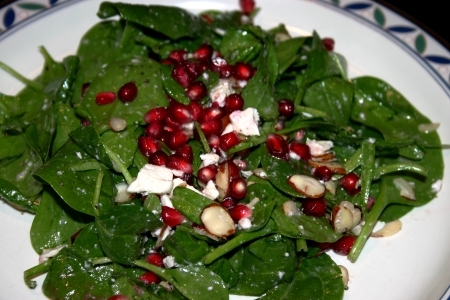 This salad not only has great presentation, but is very easy to make for a dinner party. Removing the seeds form the pomegranate is probably the most time consuming portion, but can be done ahead of time. The almonds can be toasted ahead of time too, so all you have to do is toss and plate. Engage your family in removing the seeds from the pomegranate by cutting it into 4 wedges and do as I do and let my girls remove all the seeds. Ingredient amounts will make 6 – 8 side salads. Rinse and drain baby spinach, set aside. Remove all seeds from one pomegranate and set aside. Place almond slices into a medium skillet over low heat stirring constantly until lightly toasted and set aside. Once ready to serve combine all ingredients and toss until evenly combined. Evenly distribute salad onto plates. Serve pepper on the side so your guests can add as much as they want. Try Veuve du Vernay Brut Rosé Sparkling Wine (France), Pozzi Bianco (Sicilia), Vin du Lac of Chelan Viognier (Columbia Valley) or McManis Family Vineyards Viognier (California).